An amalgam of the Army’s UH-60L Black Hawk and Navy’s SH-60B Seahawk, the MH-60S Knighthawk meets a U.S. Navy requirement for a fleet combat support aircraft. It offers the best of both worlds - a large cabin in which to carry passengers or cargo, and unique naval capabilities that allow it to perform transport and vertical replenishment (VERTREP) duties. It possesses the older Seahawk’s automatic rotor blade folding system and folding tail pylon, but has a “glass” cockpit whereby flight data is projected on four digital screens rather than traditional gauges and dials. The MH-60S was developed afterthe Navy’s decision to phase out the CH-46 Sea Knight. Manned by a crew of four (pilot, copilot, and two crewmen), the MH-60S flies in Helicopter Sea Combat (HSC) units. 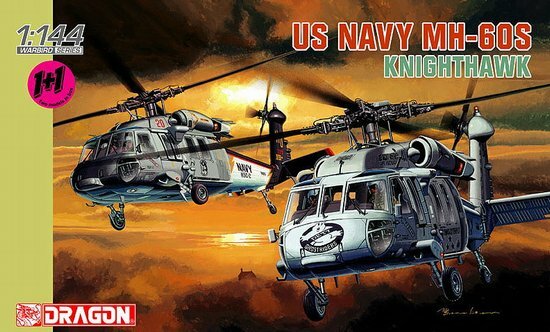 Dragon has managed to insert not one, but two, MH-60S helicopters into a fantastic new boxed set! These 1/144 scale model helicopters are highly accurate and are produced to Dragon’s strictest standards of quality. 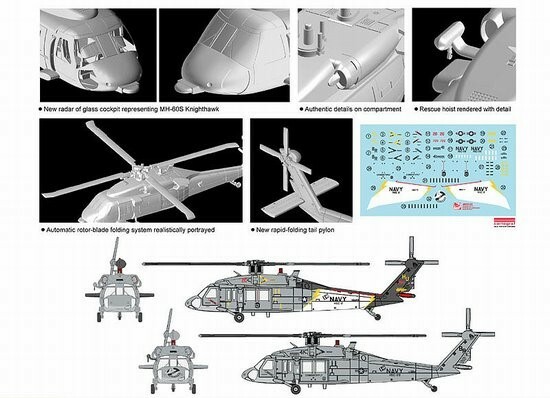 To suit the design of the MH-60S, these kits have completely new toolings for their cockpits, as well as their characteristic rapid-folding tail pylon and automatic rotor-blade folding system. These kits make up into easily assembled finished products, and once painted and “decaled”, they will look spectacular. Cartograf provides the high-quality markings to represent one Knighthawk from HSC-2 “Fleet Angels” homeported at Naval Station Norfolk, Virginia, and one from Detachment 7 “Ghostriders” (which is part of HSC-28 “Dragon Whales”). These model helicopters will keep the Navy at sea and modelers happy!